In the UK, the testing of a flying taxi made the news this week. We can set sight on a new day in vertical aerospace with the company of the same name. A full scale electric vertical take off and landing aircraft has flown and takes it place as "the UK's first full scale fully electric vertical take off and landing aircraft." This startup, Vertical Aerospace, is building technology (1) to change how people fly, (2) to expand your notion of air travel as now an "intercity" option, and (3) to offer people carbon free journeys. The Telegraph was already showing awareness of possible use cases with its headline "Bristol start-up launches UK's first electric 'flying taxi'." Actually, however, according to Bloomberg, that is quite the intention of the founder of the company, as "he intends for it to offer inter-city flying taxi services that take off and land vertically within four years." He is CEO Stephen Fitzpatrick. The company began in 2016. In 2015, a year before founding Vertical Aerospace, he bought the Manor Marussia Formula One team. "I saw a business opportunity in applying Formula 1 technology to aviation to transform short-haul travel and make routes like London to Madrid shorter by getting rid of the need to take off from a runway," he said in the Bloomberg report. "The lightweight materials, aerodynamics and electrical systems developed through F1 are highly applicable to aircraft, much more so than to road transport," said Fitzpatrick, according to CNN. The group described it as a "technology demonstrator" aircraft. Translation: a prototype. Its weight is 750 kg. Bloomberg's report said it looked like "a car-sized version of many popular consumer drones."' The VTOL aircraft was designed, built and flown in just 12 months, said CNN. "We expect our piloted vehicles will take people from one city to the next by leaving closer to people's homes, not necessarily at airports." Fitzpatrick was quoted in Bloomberg. Reader comments on the YouTube page included one who wondered about noise. "Interesting that they've chosen ducted fans. I suspect that's to reduce the noise signature. I'd like to hear how much noise it makes. That will be key to having these concepts getting into actual service." Another viewer asked, "would it be possible to add printed solar panels to top up the power? Surely adding power generators to the drive train or rotors would add too much weight?" Meanwhile, there is no sign that these will appear any day soon. Think of waking up to a headline in 2022 for the story about this service launch. "We've taken the view that it'll take a long, long time before regulators and passengers are okay with this," Fitzpatrick said in Bloomberg." "Proving that the technology works is very different from proving that it never fails, which is what aircraft regulation requires." Business Insider said the flights within four years would accommodate two passengers and one pilot." A spokesperson told Business Insider that autonomous on-demand flights could come later. 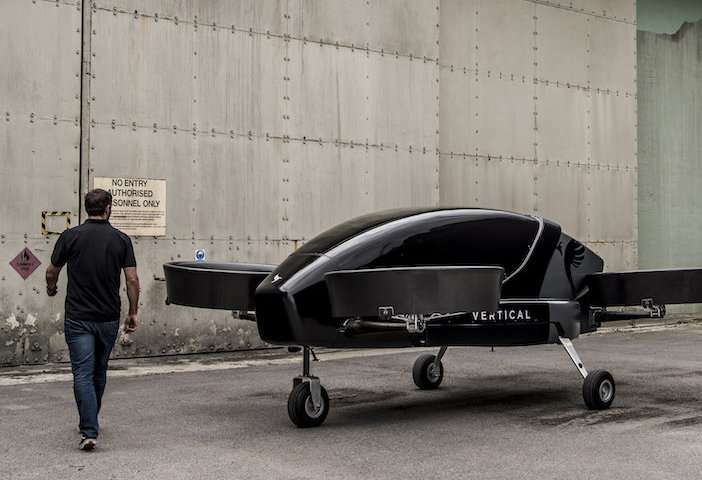 The Verge: "Vertical Aerospace says it aims to launch a fully operational "air taxi" service by 2022, but plans to do so with pilots, rather than without, in order to comply with existing aviation regulations." To achieve the desired performance including the necessary power storage for emergencies will be a difficult challenge. I doubt if the technology has reached that stage yet.